Went to the Bucs game the other day. A special “Holla” to the folks at the Pittsburgh Tweetup group for coordinating. Despite the Pirates losing, it was a great time except….. well…. 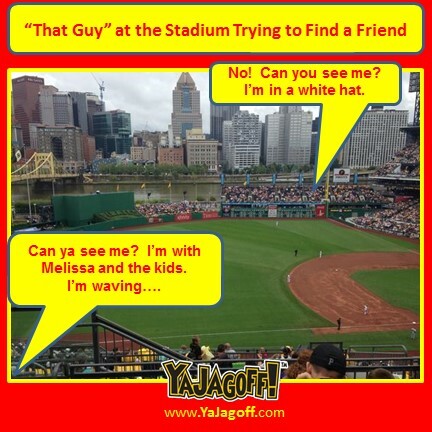 But then, sometimes, ya have “that person” in your section that loves the challenge of finding their friend in the crowd…. talking on their phone, while waving madly, attempting to explain, to the person on the OTHER SIDE OF THE STADIUM, or even worse, UP BEHIND THEM, exactly where they are sitting. I’m in the white hat, section 234,holding the large bucket of popcorn, Melissa is right next to me, just underneath the “s” in the word “Strike” on the scoreboard…. no.. not the jumbo tron, the small scoreboard. This is also the same guy that spends the entire game trying to be the “entertainment guy” of the section….. everything from multiple failed-wave attempts to yelling 1970-ish “Stevie Wonder” cat calls at the umpires to explaining the relevance of the “walk up” songs for each one of the Pirates as they come up to bat…..despite the fact that he probably spells EMINEM, “M & M.” as he searches for his songs on the iTunes Store. I’m all about a good time but…. attempts at being the class clown should be limited to 3 strikes! If there are no take-ups by the crowd, sit down and enjoy the game. Thankfully, this guy DID eventually get the people across the stadium to spot him. You would’ve thought he hit the MegaMillions. Hey Sammy the Section Simpleton.. you maybe be really funny at all your friends’ parties. You may even crack up the family and make grammy shoot gravy out of her nose at Thanksgiving Dinner each year. But this is a little different. This is not Last Comic Standing (and waving at their friends on the other side of the stadium while talking on your cell phone) Ya Jagoff! Previous articleWe Need a Book Title Ya Jagoffs!